There is a peanut butter monster that lives in my house. That peanut butter loving monster is my husband. For every French pastry that I create there is a request for something to made with peanut butter. The man loves it. He is known to spread thick peanut butter over his waffles in the morning, he will happily eat peanut butter and jelly sandwiches for lunch, and just the mention of a peanut butter dessert has him practically jumping for joy. Sometimes, I’m suspicious that he’s been eating straight from the peanut butter jar with a spoon (at least I hope he uses a spoon). 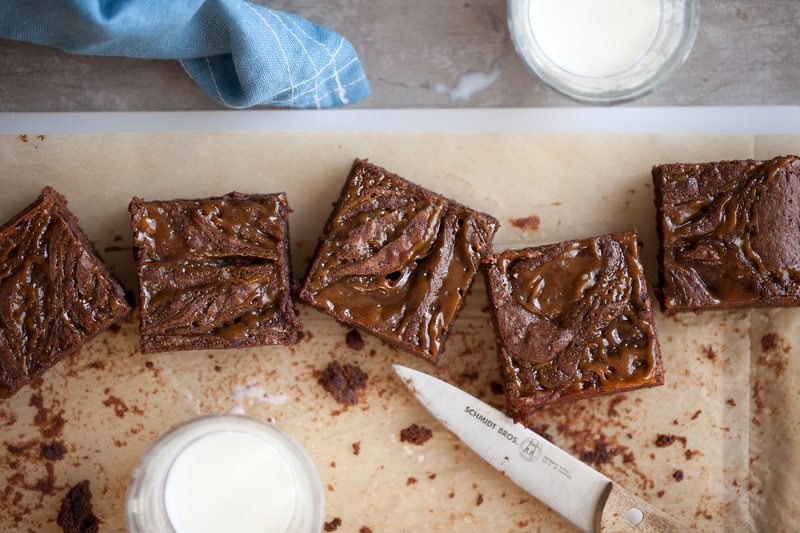 That’s how I knew he’d love these Salted Peanut Butter Caramel Brownies. It’s satisfying to see that brilliant grin cross his face when he takes the first bite. Freshly baked, these swirled brownies are a happy medium between fudgy and cakey in texture. The next day, they become more fudgy, richer, and more intense. 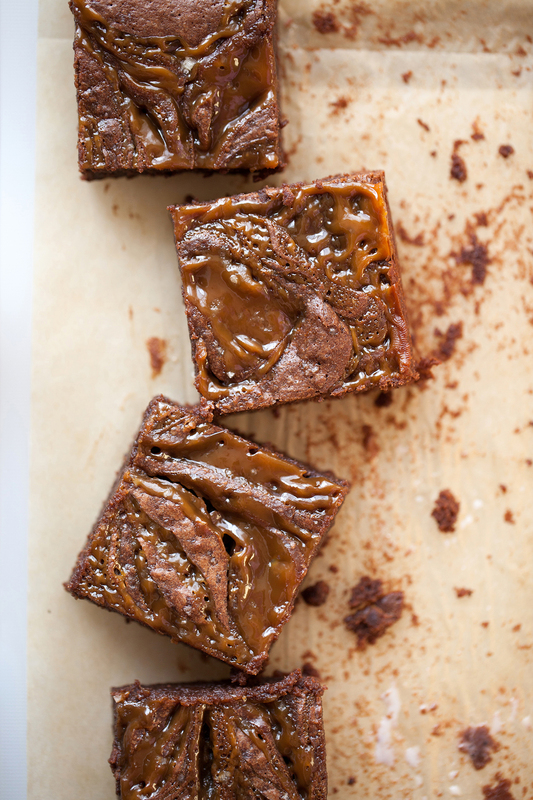 Instead of adding a heavy peanut butter to these already rich brownies, a light salted peanut butter caramel is made first. Swirled into the top of the thick brownie batter and liberally sprinkled with course fleur de sel flakes. The salt perfectly balances the sweetness of the brownies. The peanut butter aroma from the caramel wafts into your face just as you are about to take a bite. Every. Time. The caramel is smooth and silky. Can you tell how much we love these brownies? It’s a lot. Poor brownies don’t stand a chance. Preheat the oven to 350F. Line a 9×13-baking pan with parchment paper or spray the bottom and sides of the pan with oil. Pour the brownie batter into the prepared 9×13 baking pan. With an offset spatula or spatula, smooth the surface of the batter evenly. 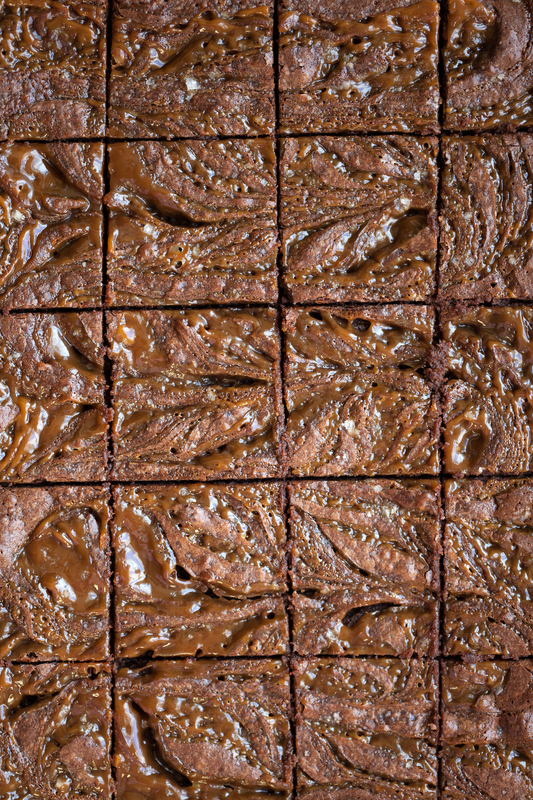 Using a spoon, drizzle on the peanut butter caramel in wave-like motions across the surface of the brownie batter. If the caramel is too thick, reheat slightly in order for it to flow more easily. Next, using a butter knife or skewer, drag the point of the knife through the top of the batter surface in a similar wave-like motion. Do this in the opposite direction of the caramel waves, so it will produce a nice marbleized/swirl effect. If using, sprinkle the fine sea salt all over the surface of the batter. 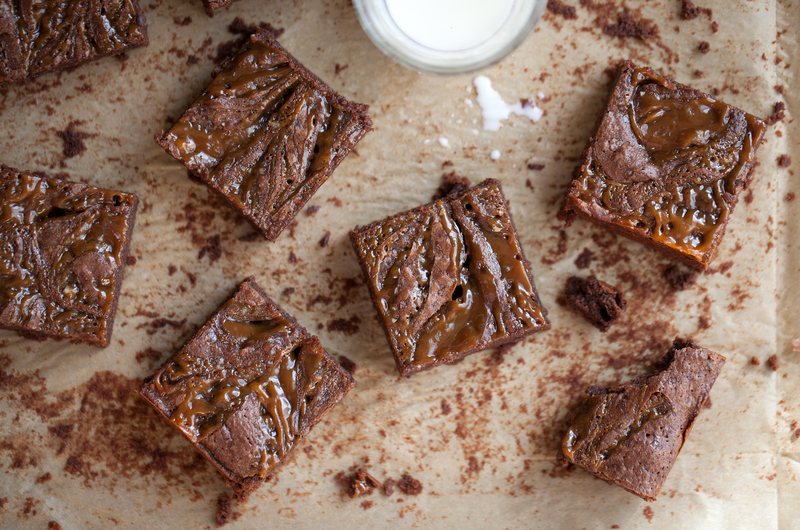 *I’ve also shared these Salted Peanut Butter Caramel Brownies on Food52. Take a peek, at food52.com, for other recipes that I’m sharing with them there. Food52 is a fantastic food community site, full of great recipes, kitchen & home products, and cooking contests. You’ll love it! These look so delicious. I can’t stop staring at them. And your husbands sounds like he knows what’s good for hime. Thank you, Kimberly! My husband would absolutely agree with you and I’ll be sure to let him know that someone supports his peanut butter habit. Thank you for stopping by and for all your sweet support on Instagram. It always makes me smile. :) Have a great weekend! Teresa! Hi. So happy to have discovered your corner of the world tonight—it’s absolutely exquisite. And I, like your husband, am a total pb monster. These sound like perfection. Hello, Lily! So happy to have you stop by. 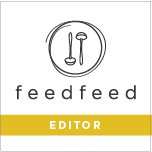 I actually realized that it’s your beautiful work that I’ve been coming across while editing at feedfeed. Always thrilled to see such beautiful work from a fellow feedfeed editor and it’s a joy to share it, so thank you for all your hard work! Also, my husband will be glad to know that he’s not the only pb monster out there. ;) Have a wonderful day, Lily.